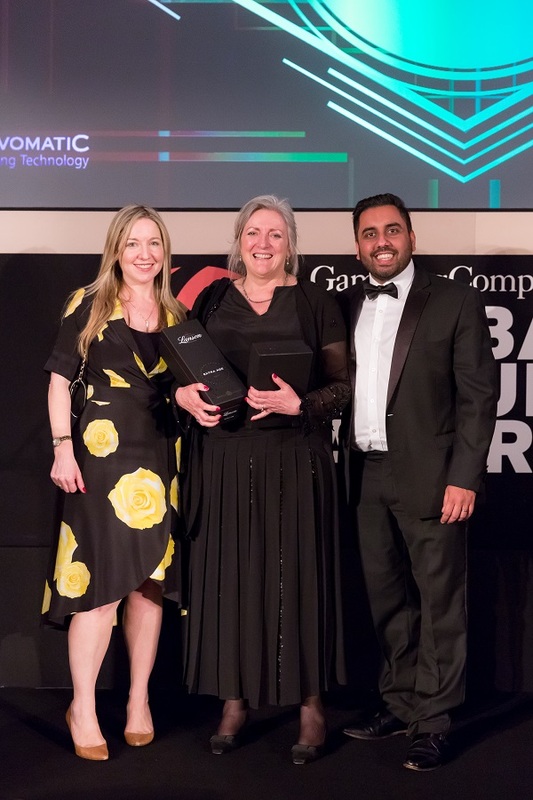 Cherry Hosking, Company Secretary of The Bingo Association, won Compliance Officer of The Year at the Gambling Compliance Global Regulatory Awards, held at The Sheraton Grand, Park Lane, London on Wednesday 18th April. The Award acknowledges an outstanding compliance professional that always goes beyond the call of duty and has embraced the compliance function within their organisation, implementing it effectively with enthusiasm and vigour. Judges were looking for an exemplary individual who pro-actively embraces the compliance function, and who reacts to regulatory developments positively in their role. The Judges found that person in Cherry. Well-known to many bingo operators, Cherry diligently goes about her work and has ensured that Association members are kept fully up to date on regulatory issues, championing compliance. Cherry was quite unprepared for the room’s riotous response to the announcement of her win, having only recently discovered that she had been nominated. Following the presentation of her Award Cherry said, “I am delighted to have won the Award, particularly amongst such strong contenders in the category: while honored to have been nominated, I didn’t expect to win! 2017 was the first full year of the bingo industry’s self–exclusion scheme, which launched in March 2016. The scheme has grown to become a robust and powerful tool in the armory of licensed bingo operators wishing to assist customers with any gambling-related harm. The scheme is managed by Cherry on a daily basis, supporting around 70 operator companies who participate in the scheme. When not managing and perfecting the bingo self–exclusion scheme Cherry also manages age verification testing across the sector, advises members on LCCP changes and has also liaised on behalf of the industry over the introduction of the new £1 coin and £5 an £10 bank notes: these roles are all in addition to being Company Secretary for two commercial subsidiaries of the Association. “I am thrilled that Cherry’s work and significant contribution to the industry been recognised by this Award: when things go well, people don’t always notice and can take it for granted. The Bingo Association represents nearly 600 licensed bingo operating premises and over 70 operating companies. It is a broad church with a mixture of the corporate and very independent: those with infrastructure and those with none. The Global Regulatory Awards are run annually by Gambling Compliance and have a total of fifteen individual categories, all relating to aspects of compliance in the gambling industry.